General Lectures (3 papers). Model Reactions and Model Catalysts (20 papers). Substrates and Washcoat Technologies (11 papers). Gasoline Catalyst Technologies (4 papers). Diesel Catalyst Technologies (5 papers). Lean NOx Catalyst Technologies (12 papers). Catalyst Ageing and Poisoning (9 papers). Alternative Fuels and Appropriate Catalysts (2 papers). Miscellaneous (4 papers). Author Index. 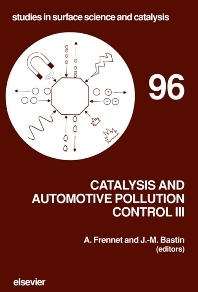 These proceedings are based on the third of a series of symposia devoted to the use of catalysis for the depollution of exhaust gases of motor vehicles. Although catalysts have been used for this purpose for some thirty years, the subject is still very topical because of its economic impact. The increasing number of submitted, accepted and published papers amply attests to this fact.